I’ve been so busy with life that it feels like forever since I’ve had the chance to sew something for myself. I really needed a quick and satisfying sew to get my “sewing groove” back. This Shoreline Boatneck did the trick! What I love most about the Shoreline Boatneck is how versatile it is. It can be made out of woven or knit fabric, has 3 sleeve options, and includes top and dress length. I had the hardest time choosing my fabric for this top. I’m going to blame the fact that it took me longer to choose my fabric than to actually sew the top on the versatility of this pattern and not my indecisiveness. I purchased some really beautiful silks on my trip to NYC and I was debating on using one of those, but I just couldn’t commit (I’ve also never sewn with silks and I was going for an easy/satisfying sew, not super scary sew). In the end I went with this great mustard and cream striped knit I’ve been hoarding from Girl Charlee. I then decided to spice things up a bit and try my hand at some color blocking. I love mustard and navy together and lucky for me, I had some in my stash! 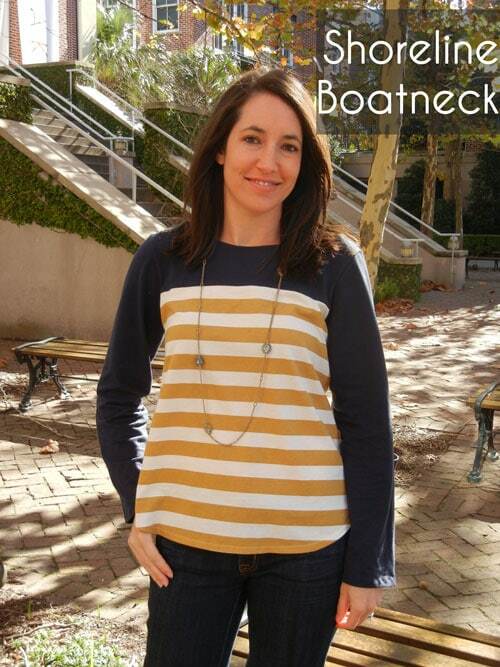 I love how the color blocking turned out and as a little added bonus…no stripe matching the sleeves! I decided to sew the size small, but could have probably sewn the XS. This top isn’t meant to be super fitted, but I like my knit tops just a teensy bit more fitted. If making this top in a woven I would probably stick with the small. The weather has been absolutely awful in Charleston, which has made it difficult to get outside to takes some pictures of my new top to share with you. The sun finally came out, but also brought with it lots of wind and cold weather. My husband did his best to try and snap these pictures in between gusts of cold wind! He actually really loves this top and suggested I wear it for Thanksgiving dinner! This knit version is not quite dressy enough, so I guess that means I better decide on one of my special silks and make another one! Love the boat neck top. I too really like the colours you have chosen, top looks really good.